Having fun with Crocuses and Hand Painted Ceramics. Why do I love Oakshott shot cottons. This is why. They bring my simple little crocuses (crocii?) to life. I’m loving the deep charcoal background too. Weird and wonderful to be appliqueing spring flowers in balmy September days with the maples turning gorgeous shades of flame outside my window. 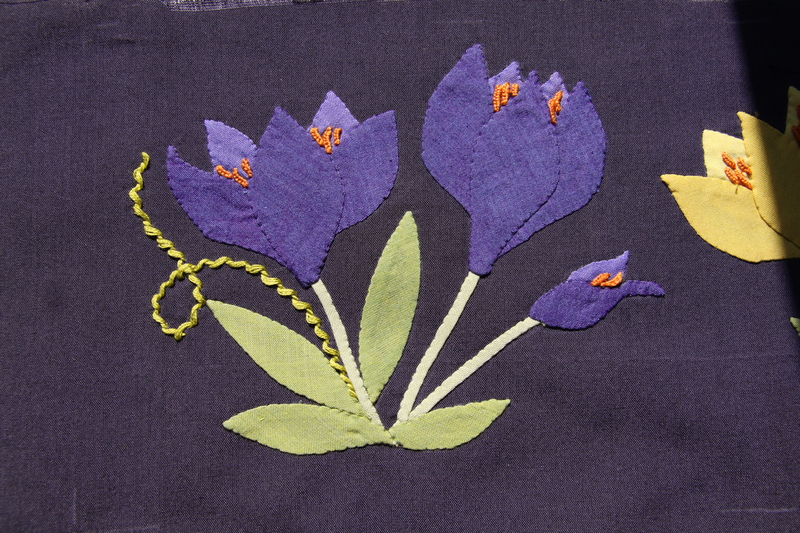 Inevitably these stubby little flowers with their spiky leaves translate into quite “cute” applique but in this case I can live with the cute factor. The modern grey background prevents them from looking too saccharine sweet too. In another vein, here are a couple of pieces of my work from long ago, cerca 1998. 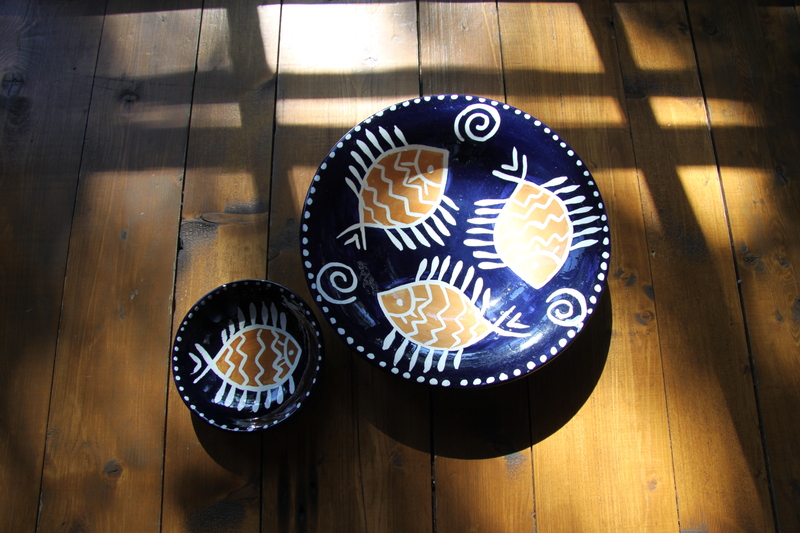 I went mad when living in Costa Rica when I discovered that a short walk away from my house was a warehouse full of ceramic blanks – plates, vases, bowls etc. They sold paints in a rather limited palette and would fire anything for you once painted. It was totally addictive and true to form I went quite mad and have a cupboard full of blue and white china to show for it. When I look at all my old painted chined I see that it is just like my applique designs even though I hadn’t even discovered applique by that point. 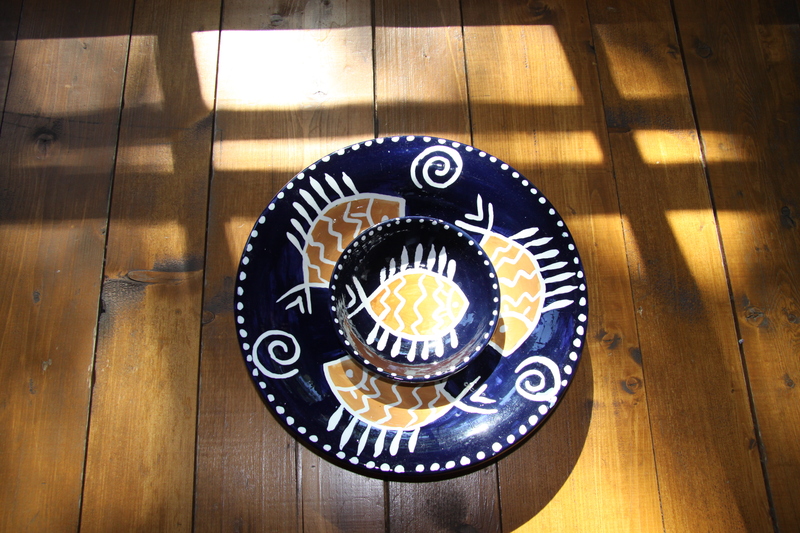 I will photograph those next week as they will look lovely in the same post as my finished Floral Impressions but in the meantime this fish plate and bowl shown below always were two of my favourite designs. In fact I am sending out a call to any competent potter with access to a kiln who may be able to make stoneware versions of my design. I would love to see these made and fired in stoneware painted with softer colours and subtle glaze. I envisage them re-worked in soft earthy neutrals, ochres and blues and greens. My town, Baie D’Urfe has a great Potter’s Guild and perhaps I should contact them to find the right person to duplicate these in hardier stoneware. An historic day indeed. I had to mention it as many of you who read my blog live in Britain, in fact a smattering in Scotland. We await with bated breath and I wish all of you Scots the outcome that you wanted. Firstly, you are all quite right to point out the rather abrupt end to the quilting video. I’m not sure why that happened but I think it might be because my Apple desk top is ancient (classed as an antique by the Apple Store at seven years old and thus unable to be updated) and my iphone on which we did the recording is brand new (lucky me). The ease with which one can supposedly zap things from one Apple source to another as boasted by our friends at Apple only appears to work if everything is brand new and updated. Given that it took months for us to actually finally get round to making the recording, that it took me at least two hours to manage to upload YouTube and then to the computer to put on the blog I just felt enough was enough and you would all get the general idea which I think, from the feedback, you all did. So my summer was bliss. After our initial cycling holiday in Quebec, 340 km in 6 days thank you very much, I knitted up a storm during Wimbledon, the FIFA World Cup, US Open and most of all whilst watching Gus at his tennis matches too. I made another “Pente” cardigan for a friend in Holland who is very happy with it indeed, lots of scarves, socks, bits and bobs and presents galore for birthdays and Christmases. As for quilting? 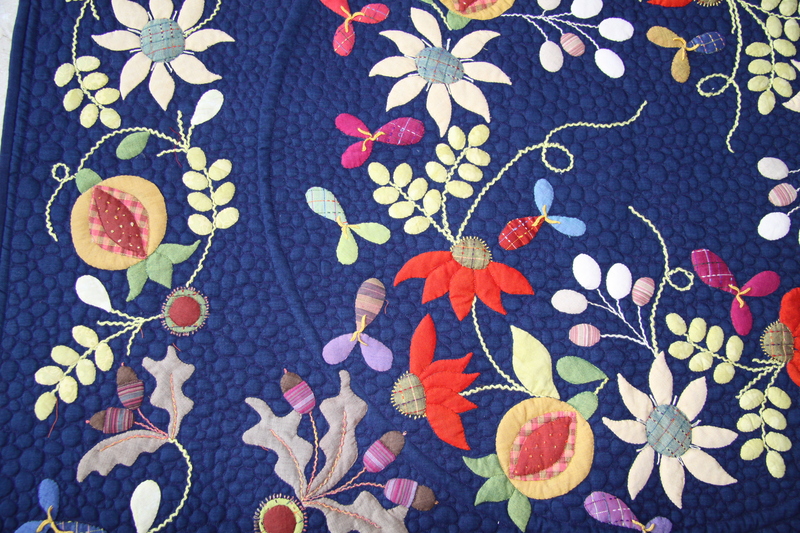 I am nearly, so nearly at the end of the quilting of my Floral Impressons mark 2 in red and I have just bound my Autumn Wreath which you saw last year. I decided to bite the bullet and give this to Karen Desparois to longarm quilt. I am a great admirer of her work, she has some quilted wonderful non-traditional creations and has some great funky ideas. 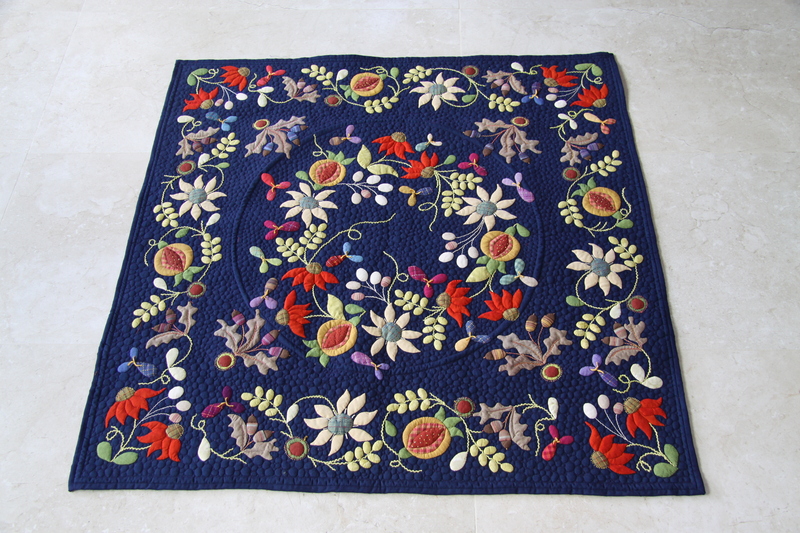 It is quite a departure for me as a hand quilter but I love her work. I told her that I didn’t care what she did with the quilt and that she could do whatever she wanted, I wanted a surprise. It was a very lovely surprise and I couldn’t be happier. And she did something really clever without even realising it. Actually on writing this I think maybe she did realise it, that her natural intuition told her what to do to bring it all into balance. The reason that I decided to finish this quilt at wallhanging size was that there was an imbalance in the design which, not matter how many three petalled flowers I added just couldn’t be remedied. Originally intended to be a full sized bed quilt with another one or two borders my heart was no longer in it as I just couldn’t get past the imbalance which shrieked at me every time I looked at it. Lest you think I am being too critical I do love the quilt, I love the colours and I especially love the use of plaids and plains together. Of course the Oakshotts are divine too. No question. For some reason Karen decided to put in a simple circle on the wreath and what is so very clever of her is that it has balanced everything out perfectly. I photographed it on the floor for the benefit of this blog as I think you can see the quilting more easily. Back to some quilting now whilst listening to Radio 4 to hear what is happening on the other side of the pond on such an all important day! Well better late than never. Gus and I finally got round to filming a bit of hand quilting before I complete my red Floral Impressions quilt. I’m sorry it has taken so long! I’m not particularly at ease in front of the camera which is only too evident but I hope you get the general idea of how I actually quilt. Although I have been absent from my blog for the summer months I will be writing within the next week with all news of quilting,knitting and summer antics so for those of you who have kindly had the patience to wait, thank you! One of the reasons that my blogging has become quite so sporadic is that I have tended to just immediately write on my Facebook account which I started for the sole purpose of recording my quilting (and knitting). It was open to the public but as recently I have added a few family pictures too you now have to ask to “Friend” me to see my posts which are mainly about sewing and knitting. If you are a fellow Facebooker who would like access to my posts please just make a friend request and I will happily respond positively. 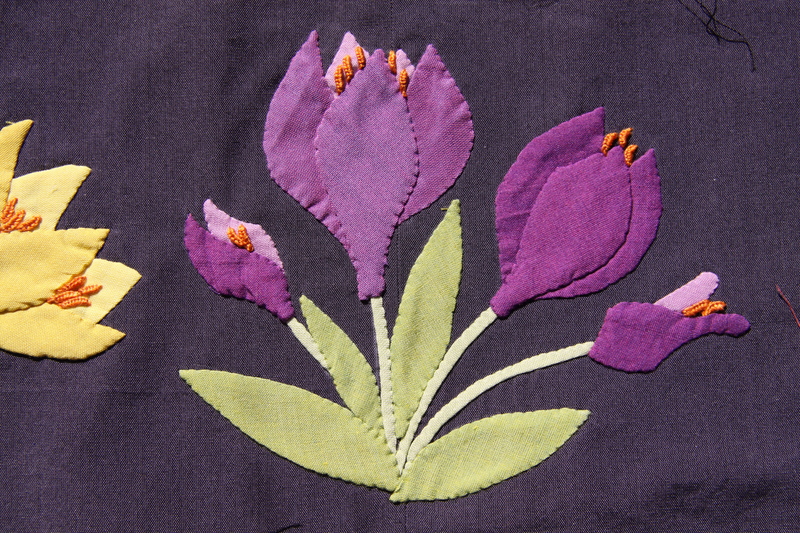 Hoping you all had a great summer and are looking forward to some serious sewing and quilting over the winter months!